Become a Friend of Fredricksen! Download a $1.00 off coupon for the sale! Who Are the Friends of Fredricksen? We’re your neighbors-young, young-at-heart, working and retired who are dedicated to supporting the Fredricksen by volunteering, advocating for library funding and raising funds to help meet the costs of the Fredricksen’s special programs and new equipment. Proceeds from our Spring and Fall Book & Media Sales and Silent Auction will be used in consultation with Library Staff to continue the programming and services offered and to help bring to fruition those in the planning stage. Special thanks to all those who donated books and media for our sales and to those businesses and individuals who donated items and services for our Silent Auction. Our sincere thank you to Brian Lockman, host of PA Books on PNC, for his enjoyable talk and book recommendations which preceded the business portion of our meeting. Please note- it’s not too late to renew your membership, keep your New Year’s resolution or start a new one to join the Friends in supporting the many services and activities provided by the Fredericksen. Kindly click on the Friends Brochure link to download your membership application. When you leave your donations at the reference desk, the first step is a quick review by the staff to see if your item might meet a need in the circulating collection or be appropriate for the ongoing book sale. The majority of the books are then sorted by teams of volunteers from the Friends. Once the materials have been sorted, they are packed and stored until the week of the sale. Thank you for your help in making our book and media sales so successful. The Friends of Fredricksen Library is a 501(c)(3) organization, so your donations may be deductible on your federal income taxes. Donation Station @ Fredricksen First Saturday of every month from 1 pm to 3 pm. 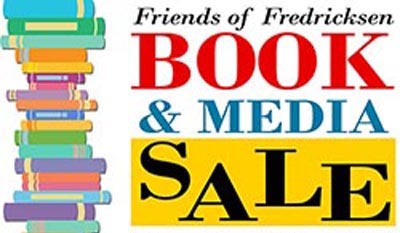 The Friends of Fredricksen have established Donation Station on the first Saturday of every month from 1 pm to 3 pm to process the donation of books and media for our Spring and Fall Book sales. Volunteers will be able to assist unloading your donations. We hope to provide convenience to you, our donors, and streamline our process for donations. During Donation Station hours, please park on the Walnut Street side parking area at the lower level employee entrance door. Donations at all other times can be given at the reference desk.